Parish Triduum: This is a three-day Parish retreat usually running Mondays through Wednesdays with advance preaching at the Masses on the preceding weekend. It consists mainly of Morning Masses and Evening Services at which some key issues of the faith are explored and celebrated. The Parish Triduum is very popular at the beginning of Holy Week or during Advent. Parish Mission: This is a full seven-day Parish retreat usually beginning on a Saturday evening and continuing to the following Friday or Saturday night. As with the Parish Triduum it consists of Morning Masses and Evening Services linked to contemporary issues of faith and life in Ireland today. Unlike the Parish Triduum, however, there is an outreach to families, schools, youth, the sick, elderly and housebound. Most Parish Missions have a Night for Youth Service which can be organized and planned locally or with help from our Redemptorist Youth Mission Teams (Belfast and Cork). It is our policy to work closely with your parish clergy, the members of the your Parish Pastoral Council and other interested parties in designing a Parish Triduum or Mission that meets the needs of your particular parish. When Saint Alphonsus founded the Redemptorists in 1732, he insisted that preaching God’s Word would be a priority for his new religious community. It remains so for Irish Redemptorists today. In fact, preaching God’s Word is more urgent than ever as the church in Ireland faces the challenges of change and crisis. So it is that we Redemptorists have made the proclamation of the Word one of our key pastoral priorities at this time. 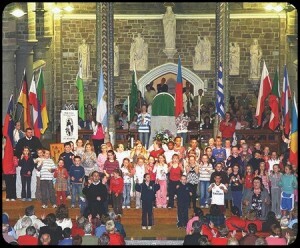 Preaching parish missions has always been the hallmark of our proclamation of God’s Word in Ireland. The way in which we do this has changed over the years. Gone are the days of pulpit-thumping and frightening people into discipleship! Today we work in partnership with Parish Pastoral Councils and others as we try to preach the Gospel according to the spirit and practice of Jesus and in fdelity to the church of the Second Vatican Council. Another feature of preaching parish missions today is the pre-mission preparation. Séamus Enright, and Brian Nolan of Mount Saint Alphonsus, Limerick, have adapted a model of pre- mission preparation used in our Vice-Province of Fortaleza (Brazil), which seeks the maximum involvement of the Parish Pastoral Council and parishioners. It also ensures that the local parish takes responsibility for its key elements during the mission week. Johnny Doherty, and Brendan Keane, of Clonard Monastery, Belfast, are also developing a distinctive model of partnership planning and involvement for missions in the Northern dioceses. We have a single National Mission Team of 12 full-time members, whose primary pastoral responsibility is to preach parish missions. The team consists of 10 Redemptorists and two women co-workers. For several years, lay people have worked on our mission teams in a temporary capacity. However, the presence of Niamh O’Neill (from Portlaoise) and Sarah Smyth (from Crossmaglen) as permanent team members is something new and exciting. Very often now during a mission I hear people say, “The lay missioner is wonderful.” There is no doubt that Niamh and Sarah have begun to transform the way in which people experience our parish missions. At the time of writing, the mission team is booked out until Autumn 2015.